The row over whether Gillingham Football Club play in blue or white shirts next season could be resolved by the fans, according to the club chairman. The news was met with anger by some fans, unhappy at the break in tradition, and the row led to chairman Paul Scally threatening to quit the club. But Mr Scally told the BBC on Wednesday the players could still be clad in blue next season - if enough fans buy blue shirts. Some fans blamed the change on sponsors Sea France, believing the ferry company had had a say in what colour the shirts would be. Last week Mr Scally said Sea France had received faxes and letters from fans threatening to boycott their services. 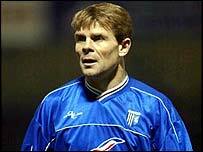 Gillingham's club shop is already taking orders for both the new white shirt and another in more traditional blue and black. Mr Scally said he would look closely at the sales of both and could use the figures to decide which to use as the first choice kit. The club website urges fans to visit the shop to see the shirts for real rather than rely on pictures of them. 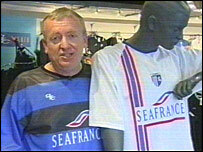 But Mr Scally denied it was a ploy to sell more £39.99 shirts. "They won't be buying them, they'll be ordering them," he said. "If they want to change their order or have their money back we will allow them to do that of course. "If they vote by pre-ordering a blue shirt and we go for the white and they decide they want the white then of course they can have the white. "Or they may wish to have neither and have their money back, which we will also honour."